Getting married is like finding a new life and honeymoon is its celebration. So Planning your Honeymoon? Come and give a treat of life time to your soul mate honeymooning in Kerala. Boat cruise at Backwater, beautiful beaches and resorts of Kovlam, cool breeze and awesome natural beauty of Munnar will add on the fragrance of love. 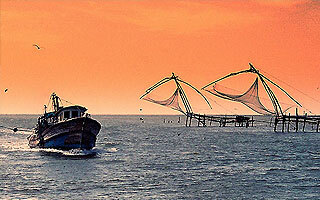 On the arrival at Cochin Airport or Ernakulam Railway Station you will be welcomed warmly by our tour representative. And, then drive towards Munnar. Munnar is a picturesque hill station situated at a drive of 04 hours from the city of Cochin. After breakfast, get ready for Munnar Sightseeing. Picturesque Munnar is a beautiful hill station encircled by three scenic rivers namely Mudrapuzha, Nallathanni and Kundale. The lush green destination is situated at an altitude of 1600 meter above the level of sea. Spend lovely time with Mother Nature in the summer resort. Famous places in the destination are Mattupetty Dam, Kundale Lake and Echo point. After breakfast, check-out from the hotel and drive towards destination full of beauty and love - Kumarkom. The destination is located at a drive of 05 Hours from Munnar. On the arrival at Kumarkom, check-in to the hotel and relax. After breakfast, get ready for excursion to Alleppey. Today, you will enjoy mesmerizing houseboat cruising along the scenic backwater of Alleppey. Your entertaining, houseboat cruising will start from 01:00 P.M. and travel to various mesmerizing parts of the backwater. Houseboat is traditional boat well-constructed and offer unforgettable experience to travelers. You will enjoy luxury services during cruise. You will hold night in houseboat. Explore the beauty of destination by sleeping under the moonlight. After breakfast, check-out from the houseboat and get ready to drive towards Kovalam. Kovalm is situated at a drive of 04 Hours from Alleppey. On the arrival at Kovalam, check-in to the hotel. After breakfast, check-out from the hotel and drive to Trivandrum Airport or Railway Station for further journey. Hope your holiday in Kerala an unforgettable experience.